SAN DIEGO, CA – LiveSource LLC and the Montgomery Biscuits are thrilled to announce a partnership to utilize the LiveSource mobile app for in-game auctions and raffles during the 2018 baseball season. LiveSource’s scope of influence now spans the entire Continental US with partnerships at every level of minor league baseball (a, aa, aaa) in New York, Florida, California, Alabama, Virginia and Pennsylvania, among other states. So far this baseball season, our partners are experiencing a more than 4 time increase in sales from their auctions with LiveSource. 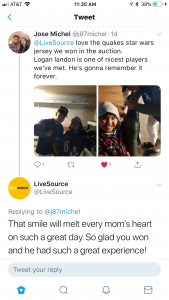 Not only is LiveSource enabling pro baseball teams to crush it revenue-wise, but their fans also have been rewarding them with incredibly positive social media posts as well. 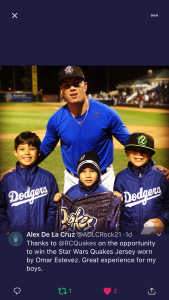 Thrilled by the LiveSource experience, fans of the Rancho Cucamanga Quakes tweeted many thank you messages following the Star Wars Jersey auction that took place during their game on 5/14/18. Here are two examples of this in the form of tweets from Quakes fans who tagged the team and LiveSource to thank us for giving them a great experience. How powerful is that to be thanked by fans for your events being so much fun to attend. This is the best organic social media mojo, and no amount of money can secure it. It has to be genuinely earned. LiveSource opens these doors for all our organizations that span the entire country! Founded in 2016 by Scott F. Levin, LiveSource enables partners to surprise and electrify fans with unanticipated opportunities to own unique collectibles and experiences. LiveSource partners can react instantly to initiate auctions for the fans while they are most excited – right then and there during the event. LiveSource is designed to benefit colleges, universities, athletes and entertainers. The LiveSource platform gives fans in attendance and at home the ability to bid on items and experiences that become available during an event. Bidding, winning, payment and delivery is all facilitated on mobile devices through the LiveSource app and website. For any additional information, please contact our silent auction and live auction sales team at 858-336-8380 or hello@livesourceapp.com.